Cauliflower is one of our favorite low carb vegetables to eat all year long. However, Cauliflower Salad particularly comes in handy when days are hot and grilling takes place outdoors. This recipe is the perfect pairing to your burgers and hot dogs, and acts as an even better replacement to the high carb, starchy side dish, potato salad! The recipe I've provided is honestly perfect to a tee, but feel free to up the crunch with some more bacon and protein with extra eggs! It's officially summer time, and even if it's not when your reading this, we're all in need of an easy, delicious side dish! This cauliflower recipe is the ultimate hot day, BBQ side dish - it's cold, flavorful and low carb! Most recipes we've made using cauliflower require baking, or pan frying so it's a nice change when you can store this in the fridge and not have to reheat prior to eating. 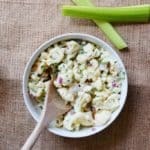 Better Than Potato Cauliflower Salad! Coat any food in mayonnaise and it will instantly be my favorite food. This principle doesn't fall short of salads - egg, potato, macaroni, chicken - I am weak for all of them! It only seems natural that I feel slighted when I can't eat potato salad during the summer time, so I made the perfect replacement. This cauliflower "potato" salad has all the flavor and crunch minus the carbs, and you won't even miss them. I even made this recipe as easy as possible for you and used the microwave to create the perfect fork tender cauliflower for the potato replacement! This cauliflower salad is so good that the first time I made it I made eight servings magically turn into two hehe. Now that you have the perfect side dish recipe for summer time what are you going to pair it with? Don't worry, we've got a couple ideas in mind! You can pair it with some Crispy Chicken Wings or a Loaded Jalapeño Burger! So next time you have a pot luck, BBQ or family dinner make this cauliflower salad recipe - you can thank us later! Recipe can be quickly added to MyFitnessPal - Search "KetoConnect - Cauliflower Salad"